Renowned for its expertise in ocean-cruising yachts building, with more than 300 units sailing over the world, Garcia Yachting expands its offer with a new model of catamaran, aluminum structure and composite coach-roof, the Explocat 52. 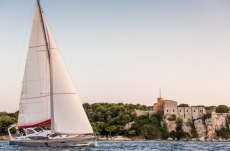 Developed in close cooperation between the naval architect Pierre Delion and Garcia Yachting, the Explocat 52 is a seaworthy, safe and comfortable boat, designed for Tropics and High latitudes sailing. Based on the experience acquired by the shipyard with the Exploration monohull range, this new unit features all qualities for long-distance cruising. The circumnavigators will find all the key specifications they expect. For more than 10 years we have integrated all the stages of the building process, from woodwork and plumbing to electricity, always looking for excellence. Our company philosophy involves gathering the best specialists in each field of boat design and boat building. Our organisation enables us assure you of the highest level of quality in your yacht and to give you a definite delivery date. We would welcome a visit by you to our yard and be happy to show you our facilities. The modular design of Garcia yachts enables us to take into account your preferences and create a unique yacht that will come up to all your expectations. 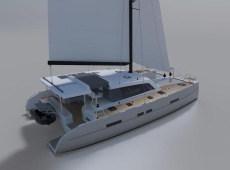 Exploration 60 In response to our clients who, having experienced the Exploration 52, see themselves onboard a larger yacht, Garcia Yachting has once again worked with Olivier Racoupeau to create the Exploration 60. So why a 60-footer? 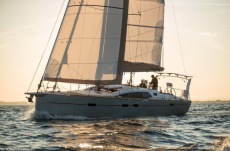 Because without doubt, it’s offering greater range, more stowage and even more refined comfort, while remaining - like the rest of the range - easy to handle for a couple without a crew, because everything is immediately to hand for the helm. Quite clearly, the designer has carried forward the DNA of previous Exploration yachts into our new flagship: the Exploration 60 is designed and optimised to sail anywhere in real comfort to unusually high safety standards. 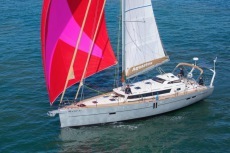 So on this yacht, you’ll find the deck saloon with a panoramic view that makes sheltered watchkeeping much easier from a true wheelhouse, the detailed attention paid to insulation with double glazing and insulated door, centralised weight distribution and external watch positions protected beneath the fixed canopy. As its name suggests, the Exploration 60 is all about exploring the most remote destinations: every function that makes mooring easier and safer is standard, including a davit for the tender, a water level platform for direct access to the sea and additional integrated mooring lines. Being significantly longer than the 52, our new Exploration offers even more, with significant doghouse provided by its aft canopy, a cockpit separated into a helming position and a relaxation area, a sundeck - because the Exploration 60 is also designed for tropical cruising - a galley worthy of any home, and a lounge space in the saloon. As well as being able to sail without limits in an easy-to-sail yacht there are also the pleasures of life on board. 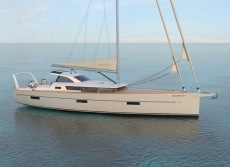 The Allures 52 has truly been designed for life at sea. It has all the traditional strengths of the Allures range, but takes them to an exceptional level. Marine interiors combining contemporary design with total respect for ergonomics, fluidity, increased living areas, option to be able to integrate household appliances, the large storage capacity and ease of maintenance are all features that position the Allures 52 as a prestigious yacht. The harmonious interior and airiness combine a sense of purity and functionality. A success story We were looking for an ocean-going yacht which would answer a sailor's legitimate requirements within the limits of a reasonable budget, which is: - safe in the toughest of conditions, - high-performance and enjoyable at the wheel, - adaptable to all moorings, - comfortable and user-friendly, - elegant (interior as well as exterior). Within our budget we soon realized there was hardly any choice available. Day after day we met sailors who had come to the same conclusions: our requirements and our dreams were the same, but there was no yacht yet to fulfill them. So we founded Allures Yachting. For months prior to reaching the concept of our boats, we had hours of fascinating discussions with a wide range of sailors - some anonymous, others famous - and integrated our own experiences, acquired through thousands of miles over the seas of the world. Close analysis of all these experiences gave us our key principles: - aluminum for safety, - a centerboard for increased freedom, - GRP superstructure for performance, comfort and elegance. 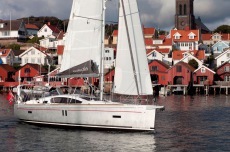 Along these lines we have been developing a range of sail yachts designed to fulfill all your yearnings. Our range includes the Allures 39.9, 45 and now the new Allures 52. The yard experienced an outstanding growth, with a turnover which almost doubled each and every year during the first six years. With the take over of Outremer (simple, fast, sea-worthy blue-water catamarans) in 2007 and Garcia (custom aluminium yachts ranging from 50 to 115') in 2010, our group has reached a leading position in the long distance cruising sailboat industry. For the past 14 years the Allures Yachting shipyard has become a reference point for blue water cruising yachts thanks to the support and confidence of its owners. Their experience, based on tens of thousand of miles aboard our sailboats, our own sailing expertise and passionate attention to architectural developments have contributed to the creation of this new gem in the Allures range. Allures 45.9 offers even more comfort, easy sailing with a small crew and better performance,all while ensuring the utmost safety. This new model is avalable in centerboard version for low draught, which enables beaching in total autonomy. Besides the centerboard version- a shipyard speciality- Allures 45.9 is also available in a lift keel version, ideal for those who prefer the performance of a lighter sailboat. The Allures 39.9 is a lifting keel yacht with aluminium hull and composite superstructure.The height under the beams (2m) offers an exceptional habitable volume. A centreboard yacht to go further, its centreboard slot is perfectly integrated into the interior layout allowing fluid movement within the saloon. Aesthetics are an important part of the journey, which is why the designers have worked over the harmony of shapes and colours, combining style and efficiency. The design is innovative, using natural and contemporary materials.